Most brides going through the variants of bridal hairstyles have probably discovered how many more options are available for long hair. 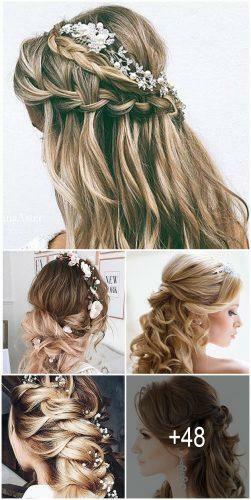 And there is no doubt as to the reasons for such popularity of wedding hairstyles for long hair. Hardly any other style will give a bride such an ultra-feminine, tender look. Poets and writers across centuries paid tribute to long flowing locks, that enchant men. Stunning loose waves or intricate updos, romantic braids or fishtail – all these styles look simply amazing on long hair. Thus, take a look at our gallery and see for yourself! What if your current day-to-day is a pixie short? You may want to reconsider your hairstyle choice after seeing our collection of best bridal hairstyles for long hair. After all, hair extensions are not so hard to get! Browse our gallery, get inspired and pin the best hairstyles for your big day!